"I've been In F&D for the last 50 years so I can’t help but knowing a bit about fifes and drums." So began Leo Brennan's story of how he came to acquire three Brown drums. He told me about his first drum, vintage 1837. It all began last February, 2009 when as a member of Mattatuck Drum Corps he was first to arrive at the corps' clubhouse. "Some of the drums they play are Brown drums. There was a card on the door of the loft (clubhouse) one night that said, “If interested in a Brown drum, let me know." Leo handed it in to the president. He spoke about it at the meeting. Brennan said that Matthew (Sunny) Lyons, 80ish, is an expert and can still play very well. He was in the U.S. Army and the U.S. Navy at the end of WWII and the Korean War. Matt and Leo looked at the drum and Matt recommended buying it. Leo did so and got the history. 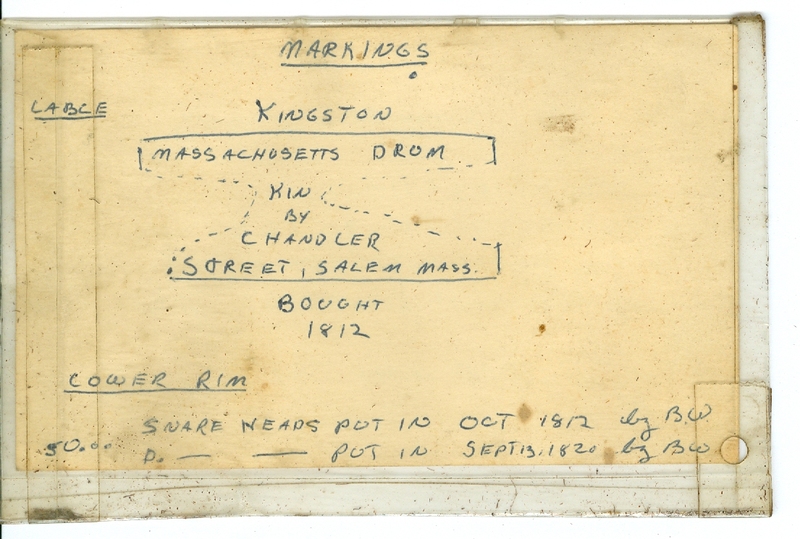 The drum had been part of the Alex Smith collection, an apple farmer from Northford, CT. In 1897 he won the CFDA championship. He loved Brown drums, and had at least 8 of them. He would hand rub the drums during the winter to give them a luster (before modern distractions like television). Leo never met Alex Smith but heard stories. He would insist that visitors who could play do so with him. Leo mentioned that there are articles about him and his drums, including his bass drums. 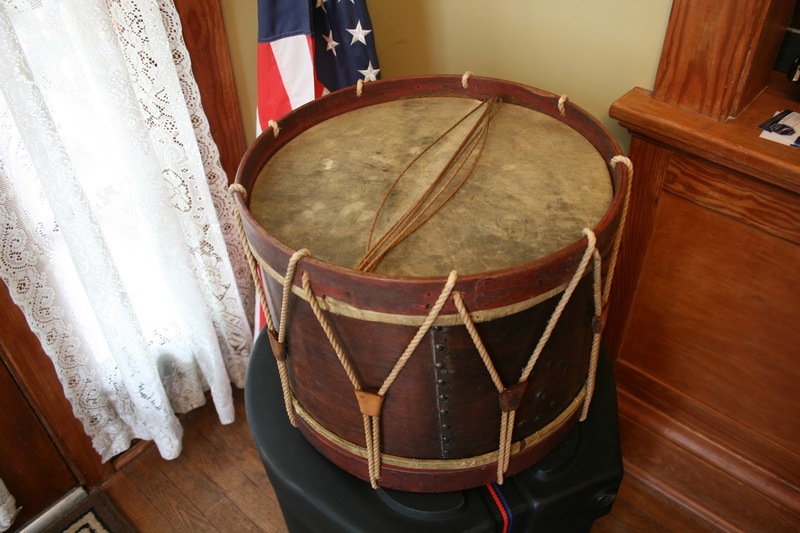 Leo said that he does a lot of research in the library and found a photo of an Eli Brown drum at an antique shop in New Hampshire. Leo won the drum (was outbid by several hundred dollars but with an unsigned bid). 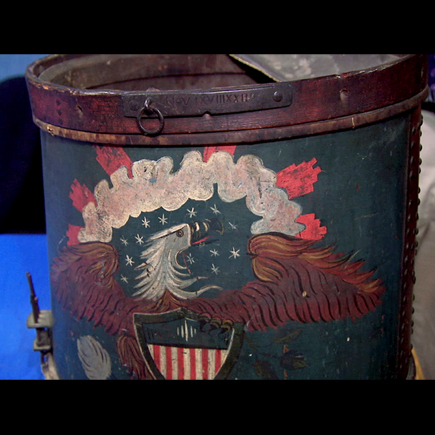 The drum was owned by Griswold who sent it for repair in 1948 to Hubbard in Massachusetts. Hubbard put new rims, rope and ears and coat of varnish, removed the snare assembly and did not replace it. That’s how he acquired his second Brown drum. Then, talking with me, he became aware of the 1809 Brown drum (he had thought the oldest Brown was 1810 - a woman at a muster arrived with a black plastic drum). I directed Leo to Barry Glick who had the drum for sale. Leo spoke of Jack Haynes, an electrician, whose aunt owned the drum. The drum had been in an attic for 40-50 years. 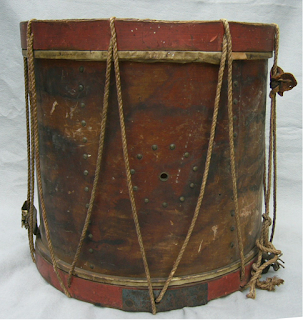 When she passed away, Haynes was the only heir and he acquired the drum. That’s how Barry Glick came into the picture (a computer guy, middle man). Jack Haynes delivered the drum to Leo who bought it for $3,000. Leo is now selling his 1837 Brown rum on eBay. His son is taking care of the eBay transaction. If it does not sell, he will pull it off eBay for 6 months. Then he will try to sell his 1829 Brown drum. Leo said that he has measured more than 100 Brown snare and bass drums. He mentioned an 1823 Brown drum that he saw at a Nathan Hale Fife and Drum Muster (Homestead). Leo also noted that Sue Cifaldi has also done a lot of work. They plan to get together and compare notes. 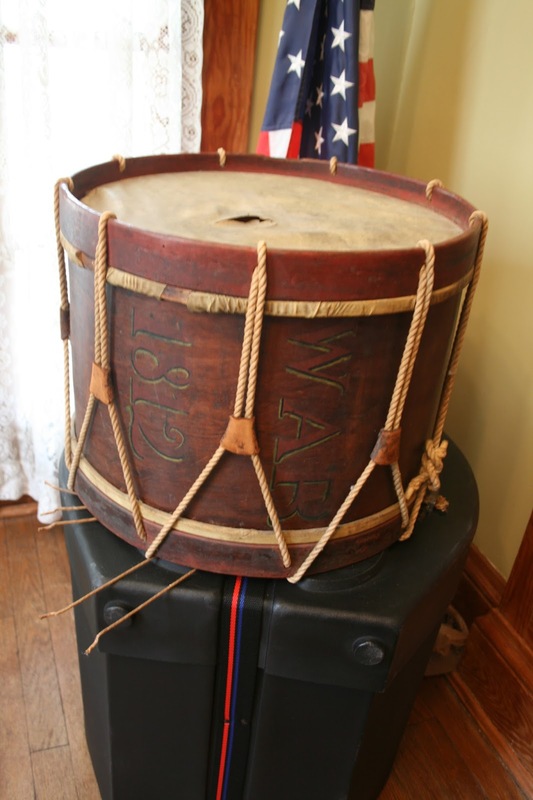 Leo mentioned "American Drums of War 1607-2007", by George Carroll -- $40.0, and "The Browns of Wintonbury, Makers of Brown Drums" -- $12.5. Leo's drums has have 16”, 17” and 18” diameters. 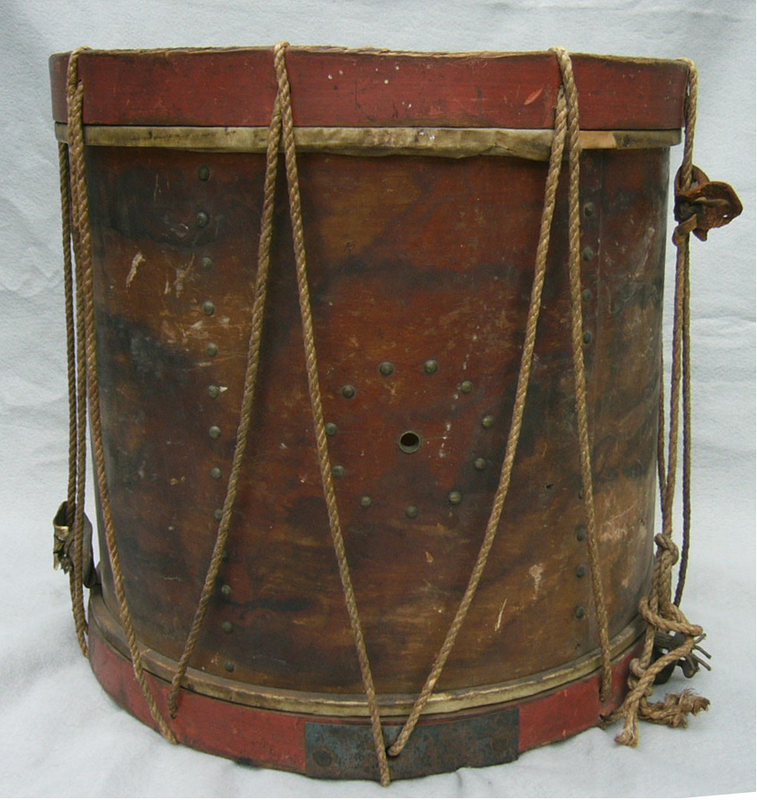 His 1837 drum is playable (but no snare assembly). 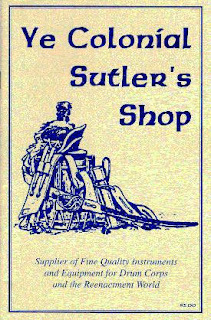 I've been in the business of sutlering for over 20 years and have met some of the best people around who have become good friends. I attend over 30 events each year and you can always find a good selection of the things you need or want on display. If by chance, you do not see what you want, ask or call me at (203) 245-9543, after 2 pm, Monday through Thursday....Fridays, I'm usually on the way to a weekend event, so when you are at an event, be sure to look for Ye Colonial Sutler's Shop on Sutler's Row. If you would like, I will gladly send you a list of events I will be attending this season. If you have an event you would like me to attend, send me an invite and/ or call me. If possible, I will include it in my schedule. 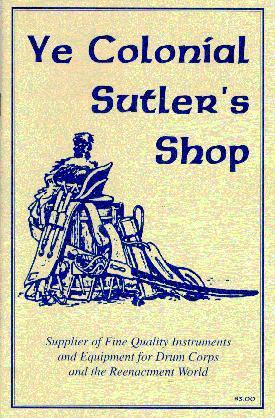 Unfortunately, with prices as they are today, it is necessary for me to charge the sum of $3.00 per catalog. This drum appeared on Antiques Roadshow originally aired November 7, 2011 (appraised August 21, 2010 in Washington, DC by Paul Carella. GUEST: It came down through my dad's family. My great-grandfather was from Pittsburgh and was a Scout River, Hudson Bay painter, and I believe this belonged to one of his brothers. 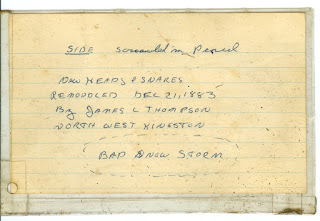 APPRAISER: And where do you think his brother used it? GUEST: I have no idea. APPRAISER: Well, it has a date on here up front, and it says November 1, 1823, and that was probably a commemorative date from the founding of the regiment of the militia unit that the original owner of this drum was in. 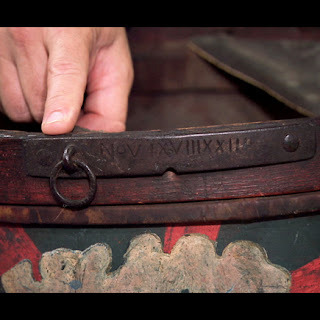 APPRAISER: And one of the things that the drum does have, if you look in the inside, is you can see the remains of a label in here. If you had the drum cover on it, how would you be able to see the label? APPRAISER: But what's very interesting is right here on the side is a vent hole, so if you peep through there, the label's directly across on the other side. APPRAISER: So you'd be able to read it. And it served two purposes: to be able to see who the maker of the drum was, and the fact that it was vital for the resonance. APPRAISER: But what's equally interesting is the quality of this federal-style eagle. It's beautifully painted, and very vivid colors, and it's fairly early as a militia drum. 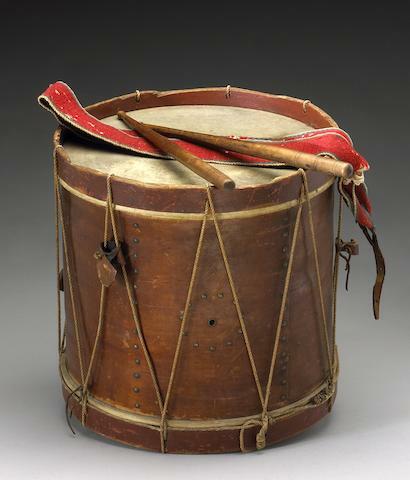 I would date the drum sometime in the 1840s. GUEST: Wow, that's really cool. APPRAISER: It's a piece of folk art more than anything else. Have you ever given any thought to what it was worth, or... ? GUEST: Well, I took it to a local high school appraisal thing, and they told me about maybe $2,000. APPRAISER: $2,000, okay. At auction, I feel that this drum is probably worth between $7,000 and $8,000. APPRAISER: Mm-hmm. It's a beautiful piece of Americana. 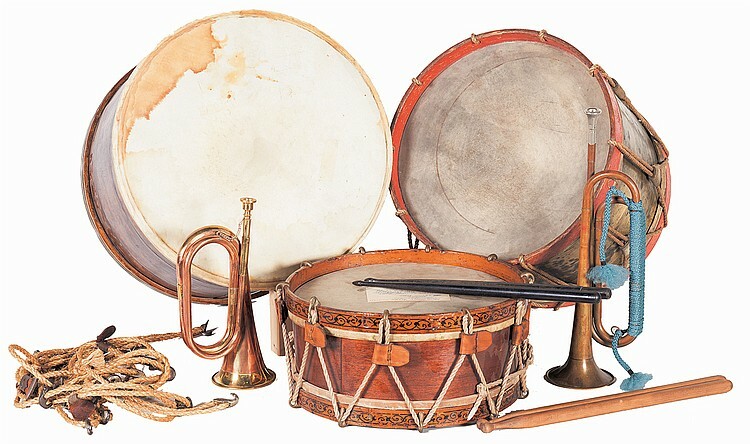 Description: Grouping of Three Snare Drums, Two Bugles and Assorted Accouterments Lot of three antique drums, two pairs of drumsticks, drum accouterments and two bugles. 1) Snare drum that measures 14" diameter and 7" high. 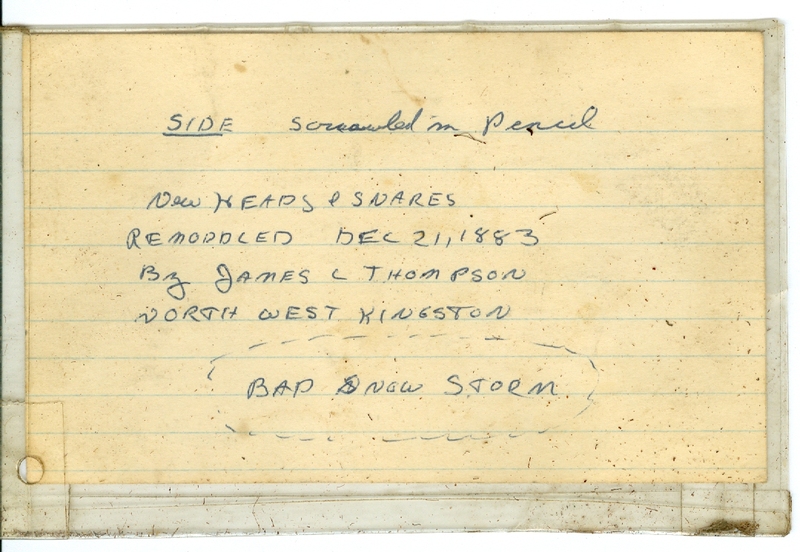 A tag taped to the drum states that has a label inside for Werner Soistman of Philadelphia, dated 4-15-1865. This label is not visible through the vent hole. 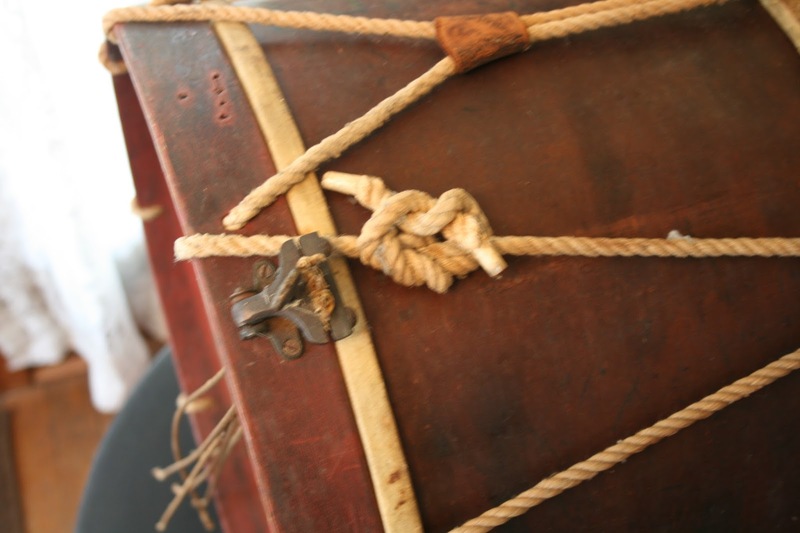 The drum has been restored with new ropes and stretchers. The painted floral scroll head bands appear to have original designs and paint. Condition: Fine as restored. 2) Snare drum that measures 16" in diameter and 12 3/4" in height with a brass body and red head bands. Condition: Fine to good with areas of discoloration overall. 3) Snare drum that measures 17 1/2" in diameter and 12 1/2" in height with a walnut body and wood/metal head bands. Condition: Fair needing major restoration. 4) Brass bugle measuring 14 1/4" in length and marked "U.S. REGULATOR/MADE IN U.S.A." with light blue cord wrap around the bottom tubes. Condition: good to very good with an aged patina. 5) Brass and copper bugle measuring 12" in length with small chain attached to mouthpiece. 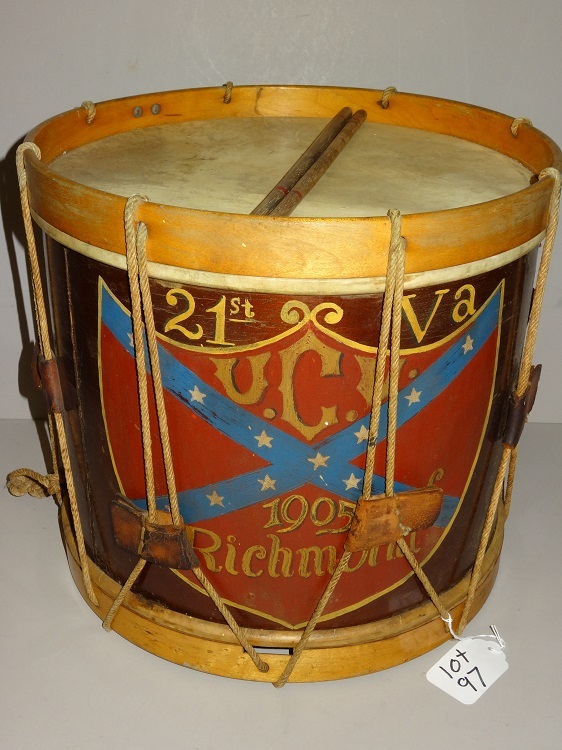 Description: Civil War Era drum with 20th Century replication of the 8th Arkansas Regiment. Refers to Shiloh, Perryville, Chickamauga, etc. 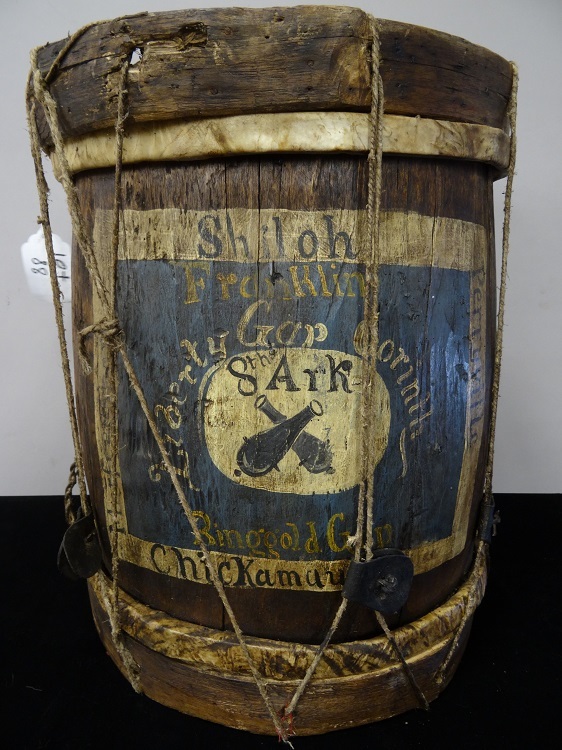 This is a very old drum that has been elaborately painted for a collector or reenactor. 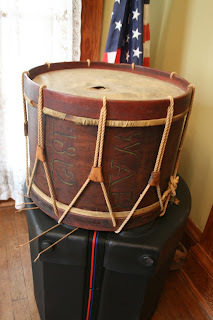 A reader wrote in with photos and information on a drum that might be a Chandler drum from the War of 1812. Comments, opinion and information are welcome. Email us at Webmaster@FieldDrums.com. Lee Vinson suggested that I write to you for some information on a drum I own that I acquired, probably in the 1970's, from a car dealer (Bob Roughton Pontiac) and old gun collector here in Hampton Roads [Virginia]. He bought it for me at a gun show somewhere in New England and I paid him around $250 for the drum and his troubles. Unfortunately the drum has been cut down. (OUCH!) I have shown it to Terry Cornett of Heritage Drums in Huntsville, Alabama who was not convinced of its age, he wanted to restore it to playing condition, and to Lance Pedigo of Colonial Williamsburg. Lance felt the drum was older than anything in their collection and wanted me to let CW display it. If you feel it may be worthy of your blog please proceed. I have, for the sake of time, simply forwarded the small e-mail string between Lee and me. There are some pictures of the drum at the bottom of the string. I will send a few more pictures in a separate e-mail. Any information on this instrument would be very much appreciated. I have given you all the provenance on it that I have at the moment. Definitely get in touch with him and let me know what else you come up with! The Stone xylophones are neat little instruments. I've run across a handful of them. They must have been super popular with theater musicians of New England in the 1910s and 20s. Ellis Mirsky (Webmaster@FieldDrums.com) is a lawyer by day and a drum blogger by night. Fielddrums.com is his baby. He might be interested in sharing your pics on the blog which could generate some leads if he doesn't have any first-hand knowledge himself. Brian Hill (brisoundperc@yahoo.com) is an avid collector of 18th and 19th century rope drums, especially those with some sort of provenance. Shoot him an email with pictures and he'll probably have something to say! Hope this is helpful! Let me know if you uncover any more info on the drum. I'd be interested to know more about it as well. I own a Stone xylophone as pictured on your blog. Yours is the only other xylo I have ever seen like it. You answered a lot of my questions about the instrument. Also, I have a rope drum, that may date back to the War of 1812. I'm sending some pictures along in the hope you may able to shed some light on it for me. I believe this drum was made in the Boston area. Handwritten markings on the above drum indicate work done on the drum in September and October 1812. That's pretty compelling information. 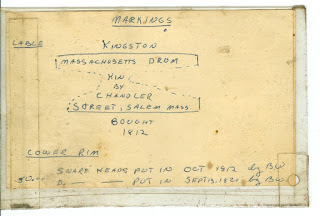 I think that the partial label indicates manufacture by Massachusetts Drums, and that “KIN” is either wrong (an incorrect transcription of what is written on the inside of the drum) or part of a longer phrase. 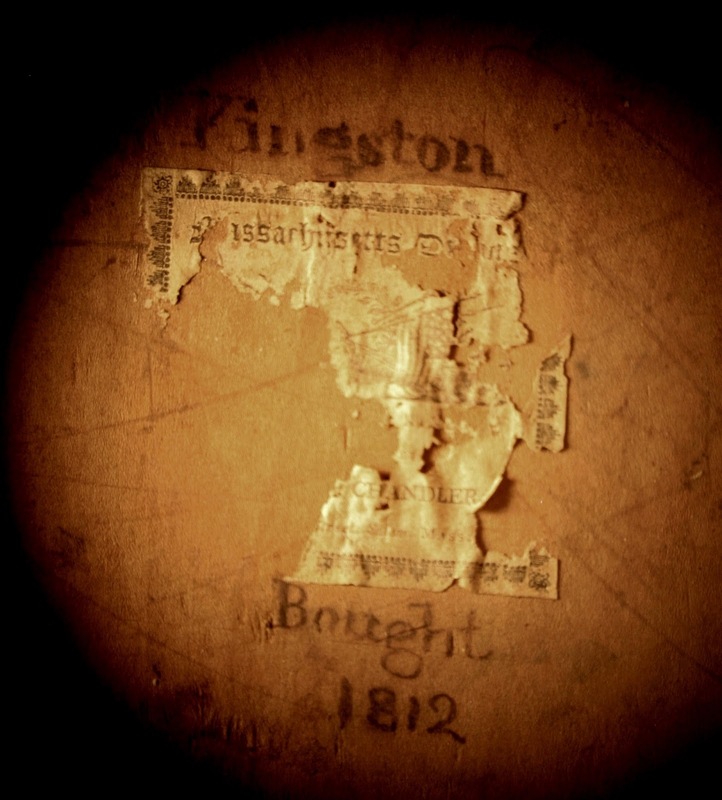 Here is a fully intact "Massachusetts Drums" label from a known War of 1812 drum. 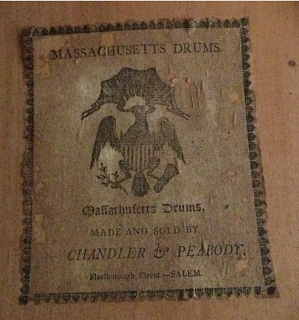 So it appears that the two drums (this one and the Lindberg drum) were made a different times (the label below by Chandler & Peabody on Marlborough Street, Salem, Massachusetts).